The concept of citizenship incorporates the belief in equal rights for every individual regardless of their circumstances to access civil, political, social and economic opportunities. 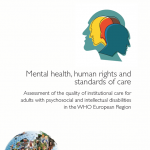 It is particularly important for people with mental health problems to enjoy the same rights and social justice as all citizens and to be protected from laws; social exclusion; institutional service and treatment practices that segregate or discriminate in any form or kind. In many countries in the world people from diverse ethnic backgrounds have struggled with being treated as different to the rest of the community. This has a significant impact on peoples wellbing and mental health. In Western countries people from black and minority communities are over respresentative in services and it is acknowledged by policy makers and providers as an issue of concern. Specifically, more people from diverse ethnic backgrounds are diagnosed as having a mental health disorder for emotional and mental distress, furthermore they are being diagnosed with serious mental illnesses more than the rest of the population. In some countries, particularly the UK, people from these backgrounds are being compulsory treated and to stay longer in hospital than the rest of the population. Instead of people from diverse ethnic backgrounds being stigmatised and treated differently they should be valued for the diversity and richness they bring to society. 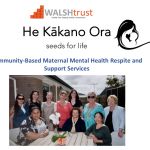 All people having an impact on an individual’s wellbeing should be aware of their own perceptions, assumptions and prejudices particularly when making judgements and assessments of an individual’s mental health status. There is much to be learned in the world from cultures, ways of life and the ways people are included of people in every aspect of a community life. For example there are many countires in the developing world with greater recovery rates from serious mental health conditions in comparison with European and Western countries. The evidence from international longitudinal studies need to be taken into account by service users, family members, policy makers and providers. Every person has the right to be treated with respect and dignity and it is essential that this is common practice by professionals, organisations and the public. Being treated with respect and dignity enhances people’s feeling that they are worthwhile and are valued, useful and important as fellow human beings. This will lead to the person gaining confidence in their self worth, self respect, ability and contribution to society. This stigma and belief system has its origins in how society chose, 200 years ago, to deal with people that they thought were very different from the “rest’ of society. Consequently, this has dictated the nature of the legal response, service provision, clinical practice, this in turn has perpetuated stigma and the social exclusion of people with mental health problems. Whilst there has been some worthy exceptions to this, they are few in number, compared to the general situation throughout the world. The IMHCN is committed to work with others to continue to fight all forms stigma and to promote actions and solutions to overcome them. Advocating and campaigning for legislation to protect the rights of users. 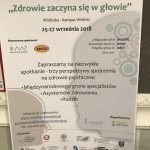 Educating professionals on how to interpret correctly the implementation of mental health laws to the maximum benefit of people with mental health problems. Mental health service providers also need to play their part in challenging practices and services that perpetuate stigma and discrimination. In this section you will find a comprehensive set of publications, research and practice papers, links and other resources that will assist you and your organisation in promoting human and civil rights. Mental disorders are ubiquitous, profoundly disabling and people suffering from them frequently endure the worst conditions of life. 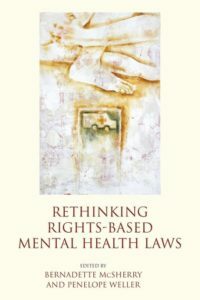 In recent decades both mental health and human rights have emerged as areas of practice, inquiry, national policy-making and shared international concern. Human-rights monitoring and reporting are core features of public administration in most countries, and human rights law has burgeoned. Mental health also enjoys a new dignity in scholarship, international discussions and programs, mass-media coverage and political debate. Today's experts insist that it impacts on every aspect of health and human well-being, and so becomes essential to achieving human rights. It is remarkable however that the struggle for human rights over the past two centuries largely bypassed the plight of those with mental disabilities. Mental health is frequently absent from routine health and social policy-making and research, and from many global health initiatives, for example, the Millenium Development Goals. Yet the impact of mental disorder is profound, not least when combined with poverty, mass trauma and social disruption, as in many poorer countries. Stigma is widespread and mental disorders frequently go unnoticed and untreated. Even in settings where mental health has attracted attention and services have undergone reform, resources are typically scarce, inequitably distributed, and inefficiently deployed. Social inclusion of those with psychosocial disabilities languishes as a distant ideal. In practice, therefore, the international community still tends to prioritise human rights while largely ignoring mental health, which remains in the shadow of physical-health programs. Yet not only do persons with mental disorders suffer deprivations of human rights but violations of human rights are now recognized as a major cause of mental disorder - a pattern that indicates how inextricably linked are the two domains. This volume offers the first attempt at a comprehensive survey of the key aspects of this interrelationship. 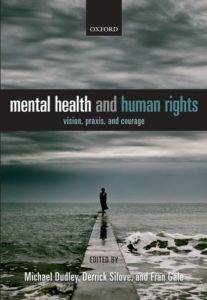 It examines the crucial relationships and histories of mental health and human rights, and their interconnections with law, culture, ethnicity, class, economics, neuro-biology, and stigma. It investigates the responsibilities of states in securing the rights of those with mental disabilities, the predicaments of vulnerable groups, and the challenge of promoting and protecting mental health. 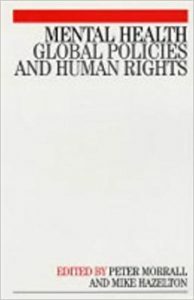 In this wide-ranging analysis, many themes recur - for example, the enormous mental health burdens caused by war and social conflicts; the need to include mental-health interventions in humanitarian programs in a manner that does not undermine traditional healing and recovery processes of indigenous peoples; and the imperative to reduce gender-based violence and inequities. 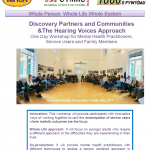 It particularly focuses on the first-person narratives of mental-health consumers, their families and carers, the collective voices that invite a major shift in vision and praxis. Society is largely blind-often willfully blind-to the ongoing violations of international human rights law when it comes to the treatment of persons with mental disabilities. 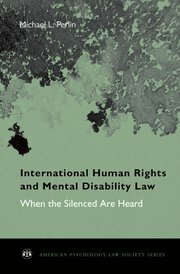 Despite a robust set of international law principles, standards and doctrines, and the recent ratification of the United Nations' Convention on the Rights of Persons with Disabilities, people with mental disabilities continue to live in some of the harshest conditions that exist in any society. These conditions are the product of neglect, lack of legal protection against improper and abusive treatment, and social attitudes that demean, trivialize and ignore the humanity of persons with disabilities.